If you were shopping online and saw the photo above of an eye shadow palette, would you be exited? It looks unremarkable, right? 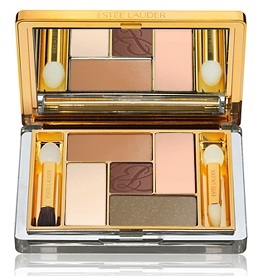 Now, take a look at Estée Lauder's Pure Color Five Color EyeShadow Palette in Desert Heat ($48) - the way it really looks. It's not brand new, but is featured on the fall collection displays at department stores. Interested? I was! After doing a quick skin test in the store, I purchased Desert Heat (05). I swatched it last week, but got sidetracked by other new introductions and news and forgot to show you the gorgeous colors. As usual, I applied all five shades with a sponge-tipped applicator, and I took my photos in full sun. I swatched in clockwise order, starting at top left and ending with the brown center shade. Look at the beautiful neutrals! There's a lot to love in Desert Heat. The shimmering copper at the top of my arm, when applied properly, will make your eyes pop. The matte beige, while not drool-worthy, is a perfect foil for the copper shade. It makes a nice base shade too. The shimmering grey has a slight khaki hue in the compact, and it's evident on the lid in some lighting conditions. I could wear it every day! The shimmering golden beige is a gorgeous base or highlighting shade, depending on the look you wish to achieve. The brown is a warm brown. It "conspires" well with the other shades, with the possible exception of the knock-em-dead shimmering grey. Although Desert Heat isn't new for fall (unless my research and questions of Estée Lauder led me to an incorrect conclusion), it's worth your attention. It was front and center at my closest Nordstrom. It should be on the new Estée Lauder display at your favorite counter. See what you think! The moral of this story is that Internet photos of makeup can be misleading. Sometimes, unfortunately, they tease us to purchase things that aren't nearly as nice as they look online. At other times, we miss amazing colors simply because they didn't photograph well. Desert Heat deserves better. Hi Charlestongirl--thanks for the real and actual natural lighting condition swatches. Now I can actually love this palette enough to be purchase-worthy. Do you think the dark brown might be leaning towards red? I love the other colors though. I can just leave that dark brown alone, if I need to. No, it's a pretty pure, although warm, brown. It's not red like the Armani one I featured earlier this week. I hate red-browns, and I'm fine with this one. Actually, I will wear it as a liner only. Not a good shadow for me. I'm so glad you brought this to our attention, Charlestongirl! I think these colors might work even better on me than the Dior Golden Savannah. I do have an EL counter in my town so I'm heading there tomorrow! That shimmery-grey really does look very khaki--and I love it! I'm obsessed with khaki shades and this one is gorgeous. I haven't purchased any Estee Lauder products since they've gone through the whole kind of revamp with Tom Pecheux, but I am really liking the look of these new eyeshadow palettes as well as the Pure Color blushes! Have fun, Grlnxdor! There is a lot of cool stuff to see at EL right now. Becca, I want a vat of that color. Tom Pecheux is a genius. I'm going to check out the EL Fall Collection this weekend and I am so looking at this one too! I like the looks of this better than Dior Savannah! That palette definitely looks much more stunning compared to the visual. Will look out for it! I couldn't believe I had missed it! Hi Xiao, please let us know what you think!